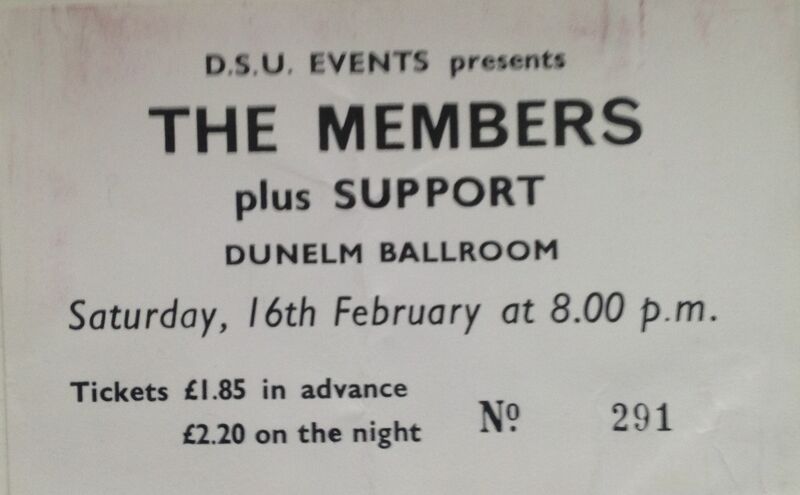 I saw quite a few bands at Durham University Students Union, which held student dances in Dunelm House during the 70s. The trouble was I usually paid at the door, and as result I have few ticket stubs to remind me of the bands that I saw there. I recall attending gigs there by Adam and the Ants, Curved Air, Slade, Climax Blues Band, Siouxsie and the Banshees, and probably many more that I have forgotten. This is one of the rare gigs that I do have a ticket stub for. The Members were “formed in Surrey, England, in the summer of 1977, …. and played at the Roxy and all the other Punk clubs on the London circuit. The original band – composed of Nicky Tesco (vocals), Jean-Marie Caroll (guitar), Nigel Bennett (guitar), Adrian Lillywhite (drums), and Chris Payne (bass) – was among the first to successfully blend reggae rhythms with punk’s attitude and aggression.” (from the Members’ official site). I saw these guys at least three times; at this gig, supporting Eddie and the Hot Rods at the City Hall and at the Reading Festival. Nicky Tesco was a great front man, who sang with a passion and really engaged with the crowd. Members’ music was a cross between punk and reggae which worked pretty well, and the hit single “The Sounds of the Suburbs” was played everywhere I went in 1979, when it reached No 12 in the UK charts, which was their biggest hit. The Members were good fun, although the only song that really sticks in my mind is “The Sounds of the Suburbs”, which was a favourite of mine “back in the day”. The Members have recently reformed although I don’t think Nicky Tesco is in the line-up. Still I bet its fun to see them again. “Same old boring Sunday morning old mans out washing the car, Mums in the kitchen cooking Sunday dinner her best meal moaning while it lasts. Johnnys upstairs in his bedroom sitting in the dark, Annoying the neighbours with his punk rock electric guitar. This is the Sound, This is the Sound of the Suburbs, This is the Sound, This is the Sound of the Suburbs !!!! 🙂 (The Members, 1979). Support from The Members and ?Magazine? Question: Are we not men? Answer: We are DEVO.